Water is one of the basic need of human being and almost all the living organisms. Water gets contaminated due to many factors like pollution, pesticides and there are many other factors. We just don’t get pure water naturally these days. Water contains many dissolved solids which cannot be separated buy traditional methods like boiling and simple filtration. To solve this problem fortunately there is technology available which is called RO purification Technology. 1 What is a RO water purifiers? 2 Why RO water purifier is required? 3 How does a RO water purifier work? 4 Is RO water purifier good for health? What is a RO water purifiers? The RO water purifiers consists of multistage filters (2 carbon filters and 1 semipermeable RO membrane). Each stage is designed to remove specific contaminants such as Arsenic, Sodium, Copper, Lead and other organic chemicals from the water to make it safe for drinking. RO water purifiers have semipermeable RO membrane which contains capillaries, which are as small as 0.0001 microns in size which helps to remove dissolved salt and impurities from the water. As the salt and heavy metals are removed by the semi permeable membrane the hard water now gets soft which makes the water sweet and pure for drinking. Why RO water purifier is required? Water having TDS (Total Dissolved Solids) of 500mg/L is acceptable according to Bureau of Indian standard (BIS) and hardness of water i.e magnesium+Calcium content in water 200mg/L is acceptable. But when the TDS (Total Dissolved Solids) of 500mg/L is exceeds and hardness which is magnesium and Calcium content in water exceeds 200mg/L then the water is considered as impure and unhealthy (Although acceptability may vary according to circumstances). Long term consumption of high TDS water can cause excess mineral agglomeration causing trace on kidney and also can cause kidney stone. Apart from that high TDS water tastes tastes bitter and salty. How does a RO water purifier work? As mentioned above water purifiers have multi stage purification system each stage contains a specific filter which removes specific type of contaminants from the water. The first filtration stage is mostly, for the protection of semipermeable membrane from getting any kind of damage from large particles. So in this stage of filtration some large particles get separated like visible solids and large sediments. Also this filtration stage helps in reducing chlorine. Sediments and carbon filters are commonly used in the first filtration stage. This stage is basically the heart of RO water purifiers. Water coming out from first stage of filtration is now passed forcefully through the semipermeable membrane. Semipermeable membrane is consist of very minute pores of 0.0001 microbes which is a little bit greater than water molecules so it allows the water molecules to pass through it and blocks large molecules of sodium chlorine and Calcium and other contaminants like glucose Eureka urea bacteria and viruses. Before serving the purified water coming out from the semipermeable membrane, it has to pass through the final filtration stage. This filtration stage remove the remaining contaminants (if there are any) to make sure that you get the safest water for drinking. The final filtration stage is usually consists of a carbon filter which removes bad odor and adds sweetness to the water. The components which didn’t passed through the semipermeable membrane are then flushed and drained out. As mentioned above above RO water purifiers removed dissolved solids and Salt from water which are harmful for human body, but it also removes some minerals like calcium and magnesium which are beneficial for health. But water is not considered as the main source for calcium and magnesium they can be obtained from various foods. Also most of the RO water purifiers comes with TDS Controller or Mineral/taste Enhancer or both to retain such essential minerals in the water. 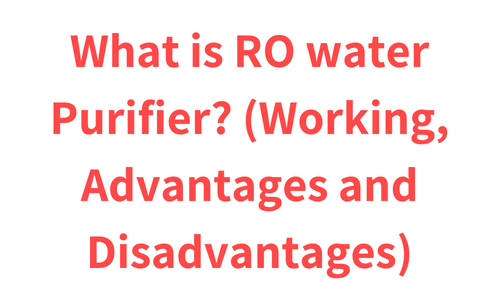 Now let’s summarise the advantages and disadvantages of RO water purifiers. RO water purifier remove harmful heavy metals like Arsenic, Lead, Cadmium. WHO (World Health Organisation) which is an international body related to health have reviewed harmful effects of heavy metals on the body. Consumption of Arsenic can cause skin cancer and some other cancers also it can cause skin lesions like pigmentation changes and hyperkeratosis. Consumption of Cadmium can cause kidney damage also conception of Lead has neurotoxic effects conception consumption. All the above heavy metals can be removed by RO water purifier. RO water purifier also removes some important components dissolved solids like Calcium and Minerals from water. RO water purifier takes long time to purify water. While purifying water with a RO water purifier very much water gets wasted. For example about 70% to 80% of water is drained out while RO water purification. RO water purifier requires electricity for its functioning so it will raise your electricity bill. As a RO water purifier remove minerals from the water it may affect the taste of water. It does not remove harmful bacteria and viruses. If you are looking to buy water purifier for your home then first you have to identify what is the TDS of your water if the TDS (Total Dissolved Solids) exceeds 500ml/L and the calcium + magnesium content exceeds 200ml/L then you should go for a RO water purifier. If the TDS of the water is under limit then you should look for other contaminents like Bacteria, Viruses and other visiable impurities and then you should go for UV or UF water purifier accordingly. See the difference between RO, UV and UF water purifiers and their working here. About 70 to 80% of the water gets wasted or drained out during out RO water purification but you can use this water for the others things like washing your car and for watering trees etc.